Who invented the ironclad Monitor of the American Civil War? 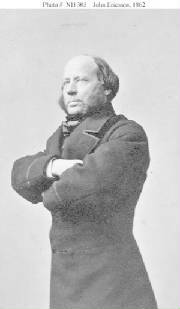 John Ericsson, one of the 19th Century's most creative engineers and inventors, was born on 31 July 1803 in Sweden. As a youth, he joined the Swedish Army, which recognized his talents and put him to work on topographical duties. Ericsson left the Army in 1826 and moved to England, where he pursued a variety of engineering projects, among them the use of screw propellers on ships, the development of extraordinarily large guns and the creation of engines driven by hot air instead of steam. Ericsson's work attracted the attention Robert F. Stockton, an influential and progressive U.S. Navy officer, who encouraged him to relocate to the United States. During the early 1840s, the two designed a screw-propelled warship, which was commissioned in 1843 as USS Princeton, armed with heavy guns of their devising. The tragic explosion of one of these guns, and efforts to improperly assign the blame to Ericsson, led the strong-willed engineer to redirect his creativity into civilian fields, which he pursued successfully during the 1840s and 1850s. The outbreak of the American Civil War brought John Ericsson back into formal contact with the Navy, when he designed and produced USS Monitor, a revolutionary armored ship carrying her guns in a rotating turret. Monitor's successful battle with the Confederate ironclad Virginia on 9 March 1862, made Ericsson a great hero in the North (see Battle of USS Monitor and CSS Virginia). For the remainder of the conflict, he was actively involved in designing and building a large series of "Monitor"-type turret ships for the Navy. Ericsson continued his work on maritime and naval technology after the Civil War, producing ships for foreign navies and experimenting with submarines, self-propelled torpedoes and heavy ordnance. He remained active until his death in New York City on 8 March 1889. In August 1890, following a memorial service at New York, his body was placed on board the cruiser Baltimore, which carried him across the Atlantic to his native Sweden for burial. Moving to New York in 1839, he soon teamed up with Harry Cornelius Delameter of the Phoenix foundry, a partnership which resulted in Ericsson's most famous work, the USS Monitor. Focusing on the man behind the inventions, this book tells the life story of John Ericsson. It details a number of Ericsson s inventions including a steam-powered fire engine, the first screw-propelled warship, a variety of "hot-air engines," and early experiments in solar power from the roof of his Manhattan home. The main focus is Ericsson's design and construction of the ironclad USS Monitor. One of the first viable armored warships, the Monitor revolutionized naval warfare the world over. The ship s battle with the CSS Virginia at Hampton Roads and its eventual fate off the coast of Cape Hatteras are covered. Ericsson's relationships with contemporaries such as Alfred Nobel and recent developments concerning the recovery of the wreck of the Monitor are also examined. About the Author: Olav Thulesius was professor at Indiana University, University of Trondheim, and Kuwait University. He is also the author of Harriet Beecher Stowe in Florida, 1867 to 1884 (2001). Olav divides his time between the United States and Sweden. Recommended Reading: Union Monitor 1861-65. Description: The first seagoing ironclad was the USS Monitor, and its profile has made it one of the most easily recognized warships of all time. Following her inconclusive battle with the Confederate ironclad Virginia on March 9, 1862, the production of Union monitors was accelerated. By the end of the year, a powerful squadron of monitor vessels protected the blockading squadrons off the Southern coastline and was able to challenge Confederate control of her ports and estuaries. Further technological advancements were included in subsequent monitor designs, and by the end of the war the US Navy possessed a modern coastal fleet carrying the most powerful artillery afloat. This book covers the design, development and operational history of the Union’s Monitor fleet. The Battle of Hampton Roads, aka Duel of the Ironclads, which made the world's navies tremble as well as obsolete, is handsomely depicted in this video. The First Ironclads – Into the Modern Era is a welcome addition for the individual interested in the Civil War, U.S. Naval Warfare, and shipbuilding and design. It also includes footage from aboard the world's most devastating “sailing ironship” the HMS Warrior.